You're listening to Insights at the Edge. Today, my guest is Karen Brody. Karen Brody is the founder of the Daring to Rest ™ Program for Women. An expert in women's empowerment and well-being, with a passion for women's leadership, Karen helps women take back rest and dream big using yoga nidra rest meditation. Karen is certified in the Amrit method of yoga nidra and trained in the level two of the iRest yoga nidra system. With Sounds True, Karen has written a new book called Daring to Rest: Reclaiming Your Power with Yoga Nidra Rest Meditation, where she teaches the leader to go to "sleep in order to wake up," helping exhausted everyone break the vicious cycle of fatigue and live the rich, full lives we all deserve. In this episode of Insights at the Edge, Karen and I spoke about the current epidemic of exhaustion in our culture, how so many of us are just not getting enough good quality rest, and how if we're not able to rest we're also not able to digest. The challenges, especially for women, who have been inculcated in the idea that we need to serve others first before letting ourselves take the downtime we need. We also talked in great detail about the healing practice of yoga nidra, known as "the sleep of the yogis," and the state of turiya that we're able to access in yoga nidra, a state of peaceful non-doing that can inform our doing. Karen and I also talked about her own yoga nidra practice and how it has transformed her, particularly in helping her chuck perfectionism, and how to bring the benefits of yoga nidra into different parts of our waking life. Here is my conversation on daring to rest with Karen Brody. Karen, to begin with, can you share with our listeners how it is that you have become such impassioned emissary for the practice of yoga nidra? Karen Brody: Yes. Absolutely. Well, I call myself a yoga nidra meditation cheerleader, and honestly cheerleader is the last thing I ever was growing up or aspired to be. But I found yoga nidra when my children were very young, I had a son who was about five—four and a half, five—and another son who was three. I was super sleep-deprived. About three years before I discovered yoga nidra, I had had a panic attack in the middle of a supermarket and I got a friend to take me to the emergency room. My husband was out of town, it was the first time I actually didn't have both my boys with me. I had put them in care to go back to work full-time. My friend rushed me to the emergency room, and I thought I was having a heart attack, and they told me that it was a panic attack. I was at the time a really all-natural kind of mama—even for myself, I wouldn't take ibuprofen. I'd have to be in extreme pain. So the idea of going on anti-anxiety pills was heart-crushing. I started taking them because I thought "I have no other choice. I have to keep going. I have to keep doing." I said, "It's going to be six months. I'll be off this in six months." Then three years later, I found myself still on the anti-anxiety pills and actually not really thinking necessarily of going off of them. But my children now were at an age just before going off to kindergarten, they were in a preschool, and again I had a little bit of time in my day. I worked from home, so I saw this yoga studio that I had been eyeing for a while and I said, "OK. I'm going to get back into shape, I'm going to do yoga to get into shape." When I walked into the studio, I was planning to sign up for a bendy, stretchy kind of yoga class. Maybe level one [or] two to get back into shape. I heard this woman guiding these other women in meditation in a far-off room, not so far-off, but I heard it and I said, "Oh, my gosh, what's that?" I walked over to the room and all these women are lying down with blankets on them, eye pillow over their eyes, bolsters under their knees, just looking like they're taking a nap. They looked in complete, deep bliss and I thought, "I want what they got. I want what they got." I asked the woman at the front desk, "What is that?" Because I've been a meditator for a long time, actually. At this point I was in my—I guess mid-thirties, maybe toward my late thirties—and I had started meditating in my twenties, around 23. So it's not that I didn't know meditation, but after I had my children I sort of lost my grove with meditation. I didn't want to sit up anymore, honestly. When I heard and I saw all these people laying down, looking like they're taking a nap, I thought, "That's what I need. I need what they got." To me at the time, it looked like a really deep, delicious nap. So I signed up and really life has never been the same. I call it yoga nidra meditation, like I call it "meditation with a cherry on top" because I love meditation, and this is meditation and it's guided meditation. But the cherry on top was the lying-down piece. The fact that it takes you into these deep sleep brain waves. I felt so deeply relaxed so quickly, and by the end of a year, I was off the anti-anxiety pills and didn't look back. I should mention that I discovered in those years of—after the emergency room, I started to flashing back to when I was a kid going with my father. My parents were divorced, and on the weekends we'd see my father. We'd go into an ambulance and we'd go to the emergency room. We thought he was having a heart attack, and he was always sent back—told he was fine. Now, my father never talked to me about it being panic. But I'll tell you now, I'm 99 percent sure it was. I can't have that conversation with my father—he's passed. He passed at the time I had the awareness. But there was a family legacy there, it's more than just my father, of anxiety and panic attacks. I thought I was destined to have them forever. So just that alone changed my life. It rewired everything. TS: OK. I think you've successfully piqued our interest about this lying-down form of meditation: yoga nidra. It sounds a little esoteric. In a nutshell if you will, can you explain to people: What is yoga nidra meditation? KB: Yes. Absolutely. I agree—yoga nidra, it's really deceiving because it has nothing to do with that bendy, stretchy yoga. Yoga is really about union, oneness and then nidra is the Sanskrit word for sleep. So this is the sleep of the yogi. This is a sleep-based meditation technique that you're guided into deep sleep brain waves with a trace of awareness. So it's not sleep. Your mind is invited to have a trace of awareness throughout it. As a result, you go into deep relaxation, which you would feel if you went into a nice deep sleep, but you go even further. You go into this fourth state of consciousness where you literally are thoughtless, and the potential to rewire and recharge your whole system becomes available to you. It's a very deep form of conscious relaxation. TS: Now, I'm imagining someone who says, "I feel very drawn to some type of deep sleep meditation, but I know how tired I am, and I'm going to be asleep in five minutes." You address in your book, Daring to Rest, and you talk about how many people have the experience of lying down, being guided. It seems like they're actually asleep, but yet they know when the meditation is over. For example, at the end of a yoga class when you do the corpse pose, savasana, somehow you wake up when the yoga instructor is saying, "Please now open your eyes." How did you know that when you were sleeping? So explain that "I'm going to go to sleep. But oh, no, I'm not actually asleep." KB: Yes. It is a little hard to grasp because you say, "Well, wait a minute, I'll just be completely out and I won't even hear your voice." That's what people think, "Am I going to get any benefit to this?" But there is a part of you that's always awake. So first of all, you haven't fallen asleep. It's at the end of yoga nidra I woke you up, but many people feel they go into such a deep state of relaxation, the mind goes—you become thoughtless. You go into this place where you see beyond the activity of the mind—to the source, into this cosmic mind so to speak. Then when you're in this space, you sometimes won't hear my voice. You'll go in and out almost like a coma. The brain waves are very similar. That's when the organs can rejuvenate, your body rejuvenates, the subconscious mind is very open to suggestion. If you're planting things like intention or saying an affirmation through the guided meditation, you're being guided that way. You really hear them on a deep level, you don't push them away like when our mind has a thousand thoughts going through it and we wouldn't necessarily easily accept some of these things. You have a lot of power during this time, but you may not think you're hearing my voice. If you wake up at the end of the meditation, you did not fall asleep. Now, sometimes people do fall asleep and that's OK too. I guess it's not the ideal thing, but many people in the beginning—it's not unusual to fall asleep maybe for the first three, four times. In that case, number one you needed the sleep, and you did still benefit because there is a part of you that is always awake. I speak to the subconscious mind when I'm guiding the yoga nidra. Whoever the voice is, the voice is speaking to your subconscious mind and it will still be hearing the instructions. One of the things that people feel is that they didn't benefit if they fell asleep. I usually say because it is better to have this trace of awareness, to not go into a sleep where you don't wake up at the end of yoga nidra, go and sit in a chair just a few times. A lot of times you won't fall into that deep, deep sleep. You'll wake up at the end and you'll be hearing my voice. You'll just be deeply relaxed. Deeply relaxed. TS: Now, we're going to go into the yoga nidra meditation process more. But before we do, I just want to talk about this idea of Daring to Rest, which is the title of your new book. You mentioned in your own life how you had two young children and that was part of your exhaustion. But it seems like we have an epidemic of people who are exhausted and underslept. I wonder if you can speak to that, and why you seem to see this as a feminist issues as well. KB: Absolutely. The time is now to take back rest. We're in constant activation mode as a culture—men and women, so it's not a gender issue necessarily—but it is something that our bodies are crying out for. The rest and digest piece. What's happening now is there are so many demands on our time, with particularly digital technology. It is enabling us to stay up all night, to not go to sleep, to literally have the lights on and never be in the dark. This is something I do talk about in my book, which is everything from digital technology—too much light, and so we don't make melatonin at night if we're on a computer or even watching the television. But also just in general, we have a lot of light pollution in our urban cities. Even out in more rural areas now, we have so much more light. The need to rest is just really for balance, this daring part is that it's so hard to do. It is so hard to do because there is always something active calling us to do something more. We all have the to-do list or we have—every moment can be filled with something to do. If anyone just thinks of their email box, there is always, "I got to go check my email because someone sent me something," and it's another thing to do. We need to be daring, we need to be bold, we need to have the courage to rest and to say to our family and friends, "I'm taking a yoga nidra nap today. Every day." For some people it's in the morning, they like to bookend their day with it. For some, it's when they come home from work before they start dinner in that evening part of their day because it gives them more energy. For some it's at their lunchtime at work—before they eat their lunch, take 15 [or] 20 minutes [to] plug into yoga nidra, go into that state of deep relaxation. Dare to rest, because we are seeing so many statistics now that are extremely alarming. For women alone, 35 million women experience sleep or wakefulness disorders and that's double compared to men. So we know that women are having—are reporting more sleep issues than men. TS: You have a quote toward the end of the book where you're recapping some of the core principles of daring to rest. This quote is "Serve yourself first, then others." I thought, "Yes, this is what is so hard for many women, for many of us, is to put your oxygen mask on first when there’s so many other people who you feel responsible for." So talk about that for women especially, and the challenge that poses when it comes to daring to rest? KB: We're natural caretakers, women. Because of that, we often get ourselves into situations where we are not getting the rest that we need. We are not daring to rest. We are caring for others, whether it's our parents, whether it's our animals, whether it's our children. There’s so many areas that women are caretakers. So many times in our lives when we become caretakers sometimes for years and years and years. If you don't balance them well, this is particular—putting on the oxygen mask is so hard for us because we want to care for others. But what we don't realize and what I know didn't hit me until I started practicing yoga nidra meditation was actually I was a lot kinder, nicer mommy to my children and to the world when I took my yoga nidra meditation nap. Very soon, my family and my household began almost demanding, "Have you take your yoga nidra nap today?" It's good because it really makes a difference and everyone around you can start seeing that. If you are caretaking somebody, if you're depleted, you are actually not able to serve on a very high level to another person. A lot of times we become angry, and resentful, and that goes into rage, and all of these pieces that doesn't serve really anybody. In fact, you may be taking care of someone but actually the vibration is very low for both of you if you're not at your best. We must dare to rest, we absolutely must. For women, I think there is a deeper call even historically. I talk about this in the book, about we have a history as women being told to rest. In the 1800s in the United States, there was a whole epidemic of women getting sick—becoming literally bedridden—because life was changing, going from an agrarian economy to an industrialized economy, and women's role were changing. They were changing so much that they had a larger voice in the agrarian economy. They had more of an active lifestyle. Then suddenly in a more industrialized economy, women were really not valued very much and they became sick. What was happening in general at that time was they were being prescribed something called "the rest cures" to deal with the woman question. A lot of women who naturally felt like leaders—and creative women in particular, Virginia Woolf, Charlotte Perkins Gilman, these writers—they rebelled against these rest cures. They said, "Wait a minute, this rest is trying to shut us up. We're not going to sit in bed and do nothing." They made a good bargain with rest and they said, "We're not going to rest." That's how we can get out in the world, and we can write our books, we can write our novels, we can be women leaders in the world. That was a good bargain at that time. But we've gotten to—life has changed, and we are still wrestling with this giving ourselves permission to rest, which was a good bargain that's now gone bad and we need to change it. We need to have a new relationship with rest. We need to stop saying "Resting makes me weak. I'm not going to show how valuable I am in the world. How I can lead." Actually, resting helps me lead. Being a well-rested woman leader is actually to your personal advantage and to the world's advantage. I wrote this book a lot because I feel really deeply about this. It's time to take back rest for women. We're losing our juice, we're losing our power. TS: As you mentioned your children saying, "Mom, I think it's time for a yoga nidra meditation now." I can definitely imagine people in a meeting holding up the "Tami, please take a yoga nidra nap" sign or something. I can imagine that. KB: Yes. That's right. My husband in his own work—and it's not just women because it's men too—my husband is a better manager at work when he started taking a yoga nidra nap. TS: Now, you use this interesting phrase "rest and digest"—we need to take time to rest and digest—and maybe you're talking about physical digestion, but the sense I got was that you were talking about a deeper kind of digestion. KB: Yes. Well, rest and digest [is] sometimes a reference that's made to turning on that parasympathetic branch of nervous system. It's as simple as that we're very sympathetic-dominant, the "do, do, do, go, go, go" branch of our nervous system is always on. To balance that, we need to turn on the parasympathetic and rest and digest. But there is a deeper meaning, there is absolutely a deeper meaning. The digest piece is really—when you rest, everything that's coming in, everything that you are processing—if we don't rest, we're not able to digest this. So instead we just react. React, react, react. Giving yourself time to rest and then digest all these things coming through to us, we can process them from a more balanced perceptive instead of just reactive, reactive. That serves everybody. That serves everybody. TS: Now, you talked about yoga nidra meditation as being the "sleep of the yogi," and you have a section of the book, Daring to Rest, on your brain on yoga nidra. I wonder if you can talk a little bit about the various brain wave patterns that we engage in when we're awake and then when we're dreaming. What are the brain wave patterns of this thoughtless awareness that you describe we can touch in yoga nidra? KB: Yes. It's very exciting. In yoga nidra, you begin in your beta brain, in your waking state consciousness, and then you're guided into starting that dream state that we all go into when we go into conventional sleep. Slowly you go into more deep sleep, so you're in theta, you're in delta. You're going into these brain waves that are deeper and your body is able to restore more. If you are a good sleeper and you're getting deep sleep, you're usually going into these deep sleep brain waves. But we're not good sleepers, so just bracket that to say we're not good sleepers. Actually people aren't getting the deep sleep brainwaves and therefore depression, [and] other things are happening—health issues because of that. But yoga nidra takes you from the waking state consciousness, to dreaming state, into these deep sleep brainwaves, and then below to a fourth state of consciousness that you can't get through sleep and it's known as turiya. In turiya, you are thoughtless. You are able to—it's like giving yourself a clean slate. You're in such a deep state of relaxation, of non-doing, that it helps to teach you and to counter all the doing that you're doing in your life. So when you come out of yoga nidra meditation, and you're brought back out from these deep sleep brainwaves and beyond to turiya, you know it's a visceral understanding that you have of non-doing. You can begin to slowly bring that into your life. Not as not doing anything, but actually feeling more at peace, more relaxed, that inner awareness and peace that you can go about your everyday instead of being on high alert. If you don't go into a state of non-doing, if don't understand how to not do—which many of us don't because we're constantly going and doing—then your brain is always in the state of react, react, react. Yoga nidra takes you through this deep sleep brainwaves all the way to turiya, into the state of non-doing. In the non-doing, we can bring that back into our everyday lives and feel much more at ease, peace, balanced. TS: After doing the amount of yoga nidra meditation that you've done in your life, and teaching so many people, is the thoughtless state of turiya—can you just call on that whenever you want in your waking life? KB: Here is the thing. Yes. But what I will say is it's like a muscle. The more your exercise it, the more easily you can call it up. Yogis actually can call it up very easily, who are going into yoga nidra often. Those of us who practice more often can usually, yes. For example, a lot of my panic attacks were in supermarkets—on a supermarket aisle, on a line. Sometimes you're on a long line there, and I can bring it up and go into that really deep calm state. Absolutely. TS: How do you do that now? I realize that we haven't introduced our listeners to the full practice of yoga nidra. But I'm curious—in the super market line, what process you go through. KB: Because when you practice yoga nidra meditation, you have a visceral understanding of what it feels like to be in non-doing. So sometimes I can just go there. But what I will say is that in the beginning, what I would do is almost like a mini yoga nidra on a supermarket line. We begin yoga nidra, we go through these—I can take you through the map. It's thinking of your body as not one body but of five bodies. In the yogic teachings, they call them the five koshas. We're cleaning all five bodies. We're cleaning the koshas—these five bodies of awareness. We begin in the physical body. We do body sensing. We rotate attention around the body. A lot of times, most of the yoga nidra will literally touch on these marma points. These are points that when you imagine them, when you sense them, you release blocked energy in the body. It's almost like going for acupuncture and instead of needles, going into different meridians to release blocked energy. You can kind of think of it as that. Touches—you feel into a certain point in your body, and we rotate attention through the body, and we release blocked energy. Then we take people into the energy body and that's when we begin to use more breath work. There is breathing that's done throughout yoga nidra, but it's guided breath work that helps you really invite in life force, and invite life, and begin to release anything that needs to die in your life. That could be a range of things. That could be anything from—maybe a little anger that you're feeling. The energy body bridges the next body, which is the mental body where you really begin to release emotions. The breath work kind of prepares you to release emotions and beliefs that aren't serving you anymore and that's when you go into the mental body. There is the physical, the energy, the mental body. In the mental body, we play with opposites. We might ask people to feel hot, and then feel cold, and then feel hot and cold at the same time. We might guide someone through a visualization and that would be speaking to the mental body and helping to process different awarenesses that will clean this mind—will basically clean your mind. Then we go into the wisdom body. That opens the wisdom body. It's almost like these Russian dolls and one opens the next, it opens the next, it opens the next. You clean the mind and then you have access to the wisdom body. In the wisdom body, we start playing with this whole idea of you being more of the witness to your life. You are less attached to certain things—to everything from emotions to thoughts. You kind of drop the ego and you become the witness of your life. That really allows you to have a surge in intuition, in deep knowing. What I would say is that's when your wild woman comes calling, for women, because your wild woman is this deeply intuitive energy in you that holds everything that you've always known, but you've been so exhausted you couldn't see straight. Some of you remember everything it is about yourself that is in alignment with your highest self, with your truth, with your true self, your authentic self. That gives you the key to the next and final body of awareness, which is the bliss body. In the bliss body, that's really when you see beyond the activities of the mind. You go to the source, to the divine, and you feel as if everything will be OK. You start to feel that in your bones. Joy can often arise here—happiness, joy, bliss—but not always. What happens is just the sense of feeling everything is going to be OK. Because a lot of times in our daily lives we don't feel everything is going to be OK. So, boom, you have this shower of "everything is going to be OK" in the bliss body, and that awareness is so powerful. When you come out of yoga nidra and you slowly—after the bliss body—begin to come out of yoga nidra and then you have your wild woman with you. You have this sense that everything is going to be OK because your wild woman knows this. This is an archetype that Dr. Clarissa Pinkola Estés has written about in Women Who Run With the Wolves. I appreciate her work so deeply. When I started noticing what women would talk about when they would practice a lot of yoga nidra, it was just clear they were "boom"—they were right, their wild woman just started to awaken. It's such an exciting moment. At the end of yoga nidra, you're just then woken up. People can go and continue going to sleep. Some people will go off to sleep after yoga nidra, they're just in such a deeply relaxed state. But typically, if you're going to go do things again in your daily life, you're woken up. Then you're up and you've gone into this deeply relaxed state. It's more than just relaxation. I would call it empowerment, but there’s many other words for it too—transformation. It's deep. TS: Now, what's interesting to me, Karen, is as you describe this, it does sound like a deep process and it sounds a little complex. At the same time, we were talking about how you're able to call on an adaptation, if you will, or yoga nidra meditation as a gateway of some kind right when you're in the supermarket line. KB: So you begin that rotation through your body, just doing a little bit of rotation through the body. You can start right at your third eye in the space between your eyebrows and you go to your throat, you go to the right side of the body, go down the right side and then go down the left side of the body and start breathing. You feel yourself sinking deeper and deeper, not sleeping but you feel yourself going into a deep state of relaxation. To be honest, for me who had panic attacks for years and years and years, if you go through even the first two bodies—the physical and the energy body—you begin to break that cycle immediately of going back into panic because your body remembers [that] it doesn't have to go there. If you practice yoga nidra, you have that understanding, you've been planting that seed because we also use something called your sankalpa, or your intention, in yoga nidra. I can talk about that in a bit as well. It's very simple. The breathing can take you there, and the rotation of attention through the body can take you back into—not into the deep, deep yoga nidra state easily when you're on a supermarket line, but you can feel the non-doing in your body. It's actually one of the only states—when you go into yoga nidra, this non-doing—that you can bring back with you. You can bring the non-doing back with you. TS: Now tell me about this sankalpa or intention that you use in the practice. KB: Well, the intention is something that you plant at the beginning, and often the middle, and sometimes the end of yoga nidra. It is a short, positive statement that helps you align to your highest truth. It can be somewhat goal-oriented, although it's usually not outcome-dependent. Typically the Sankalpa is something like, "I am worthy," let's say, or, "I am calm, joyful, and carefree." A state of being that you may not be in, but you say it as if—you say it in the present tense. Then you plant it in yoga nidra, you plant it throughout the different times in yoga nidra to remind yourself of this intention. It’s similar to an affirmation in many ways. When it's planted in the state of turiya, in the fourth state of consciousness, then your subconscious mind—again, you're thoughtless then—you don't have any resistance to accepting this intention and it is heard in your whole being on a very deep level. When you wake up, you begin to live more in alignment with this intention. To me, it's magical because it's like planting a seed. Your body is so fertile that it just grows. It's not as if you practice yoga nidra to get what you want. It’s not that kind of a practice, but I've seen a lot of people start living more in alignment with this deep truth of who they are by using the intention. TS: Do you have an intention that you use in the practice right now? KB: Yes. Actually, right this minute, my intention is "I am calm, joyful, and carefree." That is my intention, although that was one of my examples. That intention actually was because writing a book was hard and I really felt like I wanted to align more with the vibration of calm, joyful, carefree. You spend a lot of hours on things and I need to kind of remind myself that I can go to that place of calm, joyful, carefree. When you have deadlines, it sometimes feels like you can't. TS: Well, I just want to make a comment now, a personal comment, which is: I had the joy of sitting with you in person for an hour just last week. What I thought to myself was, "Wow, Karen feels to me grounded, spacious, open and at the same time, she's an ambitious person. She can be a torch carrier for this with a lot of drive. I thought that's such a beautiful and rare combination. In a way, I think you're speaking to that, the practice that you've done to generate that kind of presence. KB: First of all, thank you for that. What I will say is that after many years of being the burnout queen and then finding yoga nidra meditations—and being a leader and the burnout queen, I will say. I knew I had to do things differently. I feel like I'm really on a mission to teach other women how to be this more well-rested woman leader and not perfectly rested every moment. It's clearly—our soul asks us to be and become. It's like finding that rhythm in us to be both and at the same time, that's the full realization. So I hope in this book I'm taking people into that awareness of the being, which is the non-doing and being really delicious. Yoga nidra as a nap. But the further piece that it really gave me was this, "OK, I can also be ambitious, I can be a leader. I can be both, I just need to be connected to rhythm." What I like to call the full-bodied yam. Is something a full-bodied yam or not? If it's not a full-bodied yam, I usually don't follow it. TS: When it comes to resting, I think there can be a fear that some women have of missing out. I'm going to miss out on being able to really actualize at the highest possible level or other people will say, "Oh, she is busy having her full-body yam, I guess we'll have the meeting without her," or ,"I guess we'll have to move forward without her because that’s what she's doing. She really likes resting a lot." I wonder if there is some kind of cultural shift that you're also talking about where we need to respect rest in each other instead of like, "Oh, let's move ahead without her." KB: Absolutely. I think to me, this deep rest that yoga nidra meditation provides is a check-in kind of rest. That helps us in everything. That's going to help you in the meeting, that's going to help you lead in all areas of your life—not just at work, in all areas. I absolutely want to see this cultural shift. There are hints that it's happening slowly, but we have a ways to go. We have to a ways to go, and that is circling back to the title of the book, Daring to Rest. We need to be daring, we need to put the napping sign on our door and be models—be role models. I've done that even in my own home and I've seen it just pay off with my children. I know that with other women leaders who I think—we all have a "why" in us that we want to express in the world. "Why are we here? What is our existence? What are we doing? What's our purpose?" When we are resting, we're able to access that "why" on an even deeper level. I think the more we model it, the more people will respect it. We absolutely need to dare to rest. It's time. We're burning out, and the statistics are just bearing that out. There's no way that in 2001 to 2010 there was an increase—a 264 percent increase—at the number of women taking ADHD medication. There is just no way that that makes any sense. We shouldn't be on sleeping pills for years and years and years. Medication can help us. I was on anti-anxiety pills. I'm not saying they're not bridges to a better place. Life can fall apart and we might need them for a moment. But when you take—for example, a girlfriend of mine recently said, "I just realized that I have been on anti-depressants for postpartum depression for 15 years," and her child is now 15. It's not postpartum depression anymore. The statistics are so there that we need to rest. We need to dare to rest. TS: Now, one of the parts of the book that really moved me was your telling of a story that related to your family life and how your family relocated for a period of time to Tanzania. What happened, and how yoga nidra meditation ended up being such an important medicine for you. I wonder if you can share a bit about that? KB: Yes. Absolutely. I didn't think I was going to tell that story in this book, but oddly it felt right in the bliss body to tell this story. The book is broken up into a way where I talk about the five different bodies. In the bliss body, there is this feeling that we have when we don't clean our bliss body. That everything is not going to be OK and that we're not connected to source, or the divine, or to God—whatever one calls it. We can't really see beyond the activities of the mind. For me, and my family situation, is [that] we went to Tanzania and we had a very violent robbery. We experienced, in the middle of the night around midnight, three armed men who came in when my husband was actually returning home. They robbed us of everything, took all of our possessions, and they scared me deeply when they took me upstairs and they told me if I did anything stupid . . . They asked who was in one of the bedrooms. My two children were sleeping there. At the time, they were about six or six and half, and four and a half—maybe it was eight and six—and they said if I do anything stupid, "I'm going to kill you and your motherfucking children." Then I proceeded to give them everything that was upstairs in the house. They had already taken everything downstairs in the house. They took wires and they put our hands together and put us on the floor. I had named a woman named [Rose] who is very—she's a woman who was our maid when we lived in Kenya years ago. It was our dream to go back to Africa to live there and it was also our dream to have Rose live with us as a family because she was one of my people. I don't know how to say it any more than that. But everyone knows when they meet one of their people in life, Rose was one of my people. I loved her dearly like a sister. I love her dearly like a sister. Rose came to live with us. It was unbelievable. It's like everything that I wished for was happening, and then in that one night everything fell apart. Rose was with us, and they took Rose into another room. At the time, I didn't know what was happening, but when they left and we managed to untie ourselves in the dark, I went over to Rose and the first thing she said when I untied her—and actually we were gagged as well, so I took off the gag—I just hugged her and she said, "Karen, God is good." She said, "They didn't hurt the children." I thought, "Oh, my God. Yes. God is good." I don't know. Everything was swirling at that moment and then she said to me that she needed to see a doctor, and I realized that she had been raped. That moment and the next day were the worst days of my life. I just felt like everything fell apart. I didn't feel like anything was going to be OK. And yet, I had to tell my children it's going to be OK.
Rose was modeling to me, "It's going to be OK." She could somehow hold hope and hopelessness. These opposites, which is what yoga nidra plays with so much—everything from rotating attention to the right and left sides of the body to feeling hot or cold. Yoga nidra invites you to be able to hold opposites and as a result sort of disidentify with something, and free. It's a path to liberation to be able to hold opposites. Marion Woodman talks about this—holding attention of the opposites. Rose was so naturally good at this, and in a crisis like this where I just felt hopelessness. Rose could hold the hope and hopelessness. The next day when we woke up, she was wearing this t-shirt—this black t-shirt with white writing—that said, "Jesus loves me." I really thought two things. At first I thought, "Is she kidding me? Now?" I'm feeling so hopeless and I'm about to take her to a clinic to get pills for potential AIDS and to be checked, having been raped. I just thought, "Oh, my gosh," and then another part of me wanted the t-shirt too. But I didn't feel it yet. My journey really was—eventually we decided to leave Tanzania. It was horrible because in that sense we left Rose as well to come back to United States. I fell into a PTSD period. So did my young son, actually, who didn't see anything, but children sense things. He was very scared and he had a lot of PTSD symptoms as well. For me, it lasted about two years. Ironically, I had completely forgotten about yoga nidra meditation. How could that happen? That was my meditation with a cherry on top. That was something that I had been practicing before Tanzania. In fact, I felt terrific when we got to Tanzania but then life got busy, and we got robbed, and I forgot about it for two years. Then one day I was in my minivan having a breakdown of, "I can't do this anymore," everything in life felt like it was continually falling apart. At that point, we had lost all of our money when we got back to the United States. We didn't have much savings, but all of it was gone with the way the economy was at the time, and all of our possessions had been sold. So things just kept feeling like they were falling apart and falling apart. Then I was in the minivan and it was, of course, a dark and stormy night because Shakespeare is always around. I'm going to throw in the fog and the mist, and it was just like that. I was in my minivan and I just cried and I cried. Then I just heard this—what felt like a soul whisper—and I heard it say "yoga nidra." This light bulb. How could I have forgotten yoga nidra meditation? I had been practicing it before Tanzania, but I had been practicing it primarily as a relaxation tool. I really felt like, "Oh, my God, my kids get their nap and now mommy gets her nap." So I needed that kind of rest. But suddenly after Tanzania, I started practicing yoga nidra and it had a whole new church feel. It felt like going to church, living church, being church. I'm actually Jewish, so you can say church, synagogue, mosque—it doesn't matter. This is nothing about religion. This is that feeling of going to the source. Every time I lay down with yoga nidra, it felt like I went to the source, and that I reconnected to the divine, and I had this sense that everything was going to be OK at a certain point. I actually thought—this is where 40 days comes in, actually. I thought that I was—I said, "I'm going to practice for a year. I'm going to practice—every single day for a year—yoga nidra." I started off and I did really well for 40 days, and then I didn't practice it every day. So I did 40 days, but it was absolutely transformational. Those 40 days when I realized, "Wow, those 40 days were pretty transformational." That's when I started wanting to spread this to other people, and I started leading these 40-day—what I called in the beginning "nap quests." They were for women and they were online experiences. The 40 days of yoga nidra meditation. I saw how so many other women were really not only resting but having this "go to church" feeling, this divine connection. Plugged back in, not just to your energy but to everything—to that cosmic mind, just plugged back in. That's what I hope for everybody to receive from this daring to rest. TS: Now, you mentioned that you wrote about this experience in Tanzania in the section of the book where we're exploring the bliss body of awareness, this sense that everything is OK. So help me understand how this terrible, traumatic event led you to a deepening experience of the bliss body. KB: In the bliss body, there is this moment where you're plugged in. You're plugged into the divine, to the source, and you feel not just—it's more than faith, you feel the oneness. Everything that was falling apart is just stuff. It's the wave. You are the ocean now and the waves are just the waves. Suddenly in the bliss body you get this feeling of being more than just yourself. It's more than just your story. It's a connection to the all, and the all is one. You're floating, you're in this place of—you can call it bliss. But you can just also call it—especially for people who've had trauma, who've had PTSD, a lot of times it takes a while to feel bliss or joy, but they can feel everything is going to be OK. The moment you feel that—when you've had trauma before—the moment you can feel that, that shifts everything. That's when you can hold, "OK, that was really bad, and there is also really good in the world." You're in the and/both, not in the either/or. TS: OK, Karen. I just want to ask you one final question. Towards the beginning of the Daring to Rest book, you asked this kind of rhetorical question. You write, "What if rest could teach us the holy grail of womanhood: chucking perfection?" I thought, "I wonder how yoga nidra meditation leads to chucking perfectionism?" KB: Oh, yes. That's great. Well, you really learn the art of dis-attaching, disidentifying from things. Everything that felt so highly charged or that needed to be done perfect, you feel a loosening of that when you're in yoga nidra meditation. Whether it's through pairing of opposites, or whether it's just through the breath work and being able to breathe in life and release anything that needs to die, you start to again connect to what I call the full-bodied yam. The full-bodied yam—that's when you know your yeses and you know your nos. That releases you from that grip of perfection because perfection—often we say yes to everything. We're in that, "OK. Yes. Yes. I'm going to do that, and I'm going to do that. I'm going to stay up all night long." You start to realize in yoga nidra because you've gotten so relaxed, and you've gone again into this bliss place where you're beyond the activity of the mind. You start to realize, "Wow, staying up every single night doesn't make a lot of sense." I'm going to need to chuck perfect in order to do that. I'm going to need to. Your intention helps you chuck perfect because the more you stay in alignment with your authentic self, which is your intention, it helps you. Yoga nidra is a pointer back to your authentic self because when you clean those five bodies of awareness, then they reveal your soul, your true nature, and you see yourself so clearly. You've always known yourself, but you can now see it because you now you can see yourself so clearly. You can start to release a lot of the karma that's been holding you back. You are able to just say, "Yes, I'm going to chuck perfect today. Yes, I'm just going to be me." That involves chucking perfect, that involves letting go of perfect. Perfectionism—it not only exhausts us as women, it holds us back in so many ways. It holds us back in so many ways because perfect never ends. There is always the next thing to be perfect at. TS: Now, Karen, we started our conversation and you said, "I'm a self-confessed cheerleader for yoga nidra rest meditation." I wonder what will it look like for us to "win the game," if you will? You're a cheerleader, what will be success in your messenger work of yoga nidra rest meditation? KB: For me, success is about—well, first of all, it looks unique for each individual because I've seen this in the women who have been in my rest programs. It always looks different. But in general, success would be when you have that internal monitor go off that tells you, "OK, I've been in a lot of activation mode, it's time to rest and digest." You go not only for that checking-out kind of rest like, "I'm exhausted, I'm going to fall asleep on my couch here." No, you go for the checking in, and you practice your yoga nidra, and then you wake and you start sharing your gifts. You start expressing your "why" in the world. There is a lot to do, and I don't think we have to exhaust ourselves to do it. But there is a lot to do in the world. I think there is everything from activism to whatever your "why" is. I want to see women living their "why" but doing it from a really well-rested place so that they're remembering to lie down as well. TS: I've been speaking with Karen Brody. She is the author of the book Daring to Rest: Reclaim Your Power with Yoga Nidra Rest Meditation. 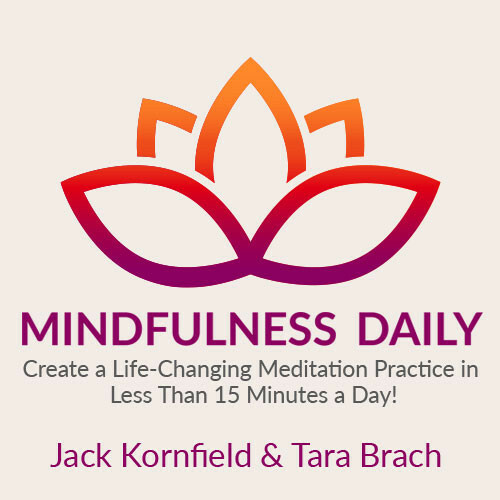 The book is incredibly well-done and includes an entire 40-day guided yoga nidra rest meditation process, and written descriptions of all the yoga nidra rest meditations you need to do across 40 days. Karen thank you for your good work and for doing so in such a well-rested way. You're an inspiration.